Lorraine Kelly is one of TV's most stylish stars, and last week the presenter pulled off one of her most fashion-forward looks yet. The 58-year-old wore a gorgeous little black dress for her Friday morning show, with a super stylish twist. Lorraine decided on a black leather look outfit for her morning show, without doubt one of the more edgier dresses she’s wore on the programme. But the presenter pulled it off brilliantly, pairing the dress with some black tights, and matching black boots from the ever-affordable Primark. So where is the edgy leather-look outfit from them? Well, Lorraine Kelly’s dress is actually from one of our favourite retailers – and a brand that’s much loved amongst her fellow TV presenters. The dress is from Sosandar, which is a brand regularly worn by the likes of Christine Lampard, Andrea McLean and Kaye Adams. So might Lorraine have got some inspiration from her ITV colleagues? Lorraine’s viewers loved the look on her, commenting to share how smart she looked. One said, ‘Best thing I’ve seen Lorraine wear in a long long time 🖤’. While another agreed, saying, ‘Very smart x’. It’s certainly a flattering option, tucking in at the waist to create an elegant hourglass silhouette. 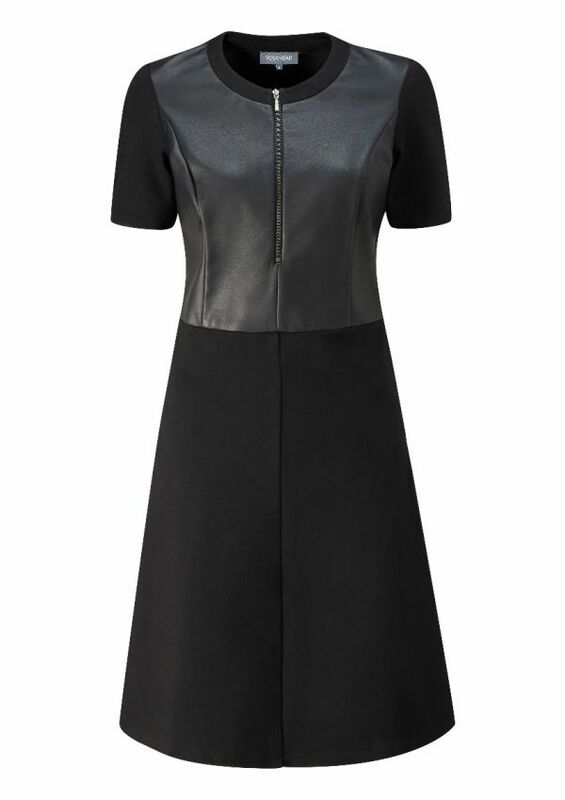 And Sosander have assured that the dress is as comfortable as it is stylish. A big concern when it comes to wearing leather is that it won’t stretch, or might be too tight to feel comfy. However, the dress is made using thick stretch ponte fabric, ensuring you’re actually able to move about! And if that weren’t enough to convince you, it’s pretty affordable too. It’s on sale for just £69, a steal for what would be a brilliant staple piece in your winter wardrobe. At the moment, the dress is still available in all sizes, from a 6 to a 20. However we predict that it won’t hang around for long now that Lorraine’s worn it – so if you fancy treating yourself, get shopping now!